Things Cooks Love: Implements. Ingredients. Recipes. 1. Make the vinaigrette: In a small bowl, combine the olive oil, vinegar, garlic, salt, and grinding of black pepper, and whisk until blended. 2. Trim the stem and blossom ends from the zucchini. With a mandoline or chef’s knife, cut each zucchini lengthwise into 5 slices each about ¼ inch thick, and then spread the slices in a single layer on a platter. 3. Heat the grill pan over medium heat until hot enough for a drop of water to sizzle on contact. 4. 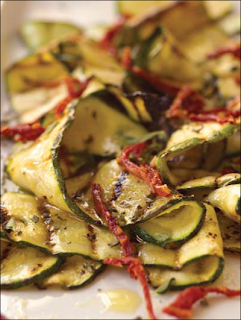 While the pan is heating, brush the zucchini slices on both sides with a film of the vinaigrette. Working in batches, place the zucchini on the pan and grill for 4 minutes, or until grill marks appear. Turn with tongs and grill the other side for 4 minutes, or until tender. As each batch is cooked, return the slices to the platter. 5. Sprinkle the zucchini slices lightly with salt. Whisk the oregano into the remaining vinaigrette and drizzle on top of the zucchini. Sprinkle with the tomato slivers. Serve warm or at room temperature.